Media and Outreach Guides : From our recent “Winning Over the Public on School Meals” webinar (available on-demand), to tip sheets on prepping for media interviews, these tools outline successful tactics for spreading the good news. Talking Points and Customizable PR Tools : Whether you’re preparing for a presentation before the PTO or an interview on unpaid meal charges, SNA can help! 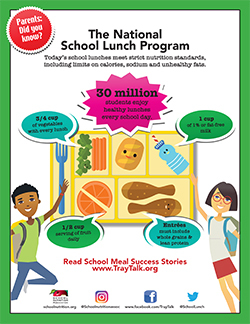 Backpack Brochures and Flyers : SNA offers customizable handouts to help you promote your program, including colorful new “Parents: Did You Know?” flyers and fact sheets detailing the benefits of school breakfast and lunch.